English and Spanish speakers are coming into increasing contact throughout the Americas, as businesspeople and tourists, students and neighbors, readers and Web surfers. 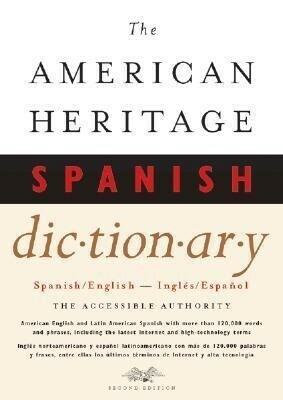 The American Heritage(R) Spanish Dictionary, Second Edition is the perfect resource for everyone who uses, studies, or simply enjoys learning more about these two important languages. Featuring American English and Latin American Spanish, this popular bilingual dictionary is now fully revised and updated. More than 2,500 contemporary words and phrases have been added from the fields of medicine, sports, ecology, and the culture of the Americas, with a special emphasis on computer technology and the language of the Internet.